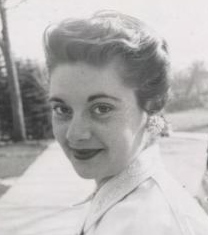 Elizabeth Gagliano, 83, of Nappanee and formerly of Syracuse, passed away on February 7, 2019 at the Elkhart General Hospital. Elizabeth Ann Gagliano, known as Betty to her friends, and “Nana”within the family was loved by everyone she met. How many people ? Betty married Joe on September 15th in 1956. 63 years later, 27 moves later as they zig zagged across the country, she enjoyed the role as the wife of a US Air Force pilot, making friends in every military base and city they lived in, and loved by all. When the Holy Spirit descended on her at a very young age, she received the gift of patience, 70×7 times ( Matthew 18:22) . She is survived by her husband – Retired Lt. Colonel Joseph Anthony Nicholas Gagliano of Nappanee. 1 daughter – Mary (Joseph) Mahlie of San Marcos, TX. 2 sons – Nick (Danielle) Gagliano of Granger, and Chris Gagliano of Foley, AL. 5 grandchildren. 1 brother – Charles J. Jehlen of Austin, TX. 1 sister – Lucille Peterson of Florida. She was preceded by 1 brother Paul Jehlen. Betty was an observer wherever she went, noticed everything, then offering her insight to make things a little better. Visitation will be held on Friday, February 15, 2019 from 3-6 PM at the Eastlund Funeral Home with a Rosary being read at 6. A Mass will be held on Saturday, February 16, 2019 at 10:30 at St. Martin de Porres Catholic Church with Father Andrew Nazareth officiating. Burial will follow at the Syracuse cemetery. Memorial contributions may be made to St. Martin de Porres Catholic Church for Masses.